The complex events that happened in Lanciano, in the province of Chieti, in 1799, were minutely narrated by the historian, Abate Omobono BocacheWho has experienced first hand the tragic moments generated, even on frentano territory, from the savage fighting between supporters of the Neapolitan Republic and the great masses of the people. This year marks the220 ° Anniversaryof those painful events and, on this occasion, the city of Lanciano is preparing to remember the characters and what they have left in the hands of history. To properly celebrate this significant day, it was decided to prepare a moving ceremony to recognize publicly the commitment of those in Italy, over the years, they have become promoters of initiatives concerning the events that took place in 1799. 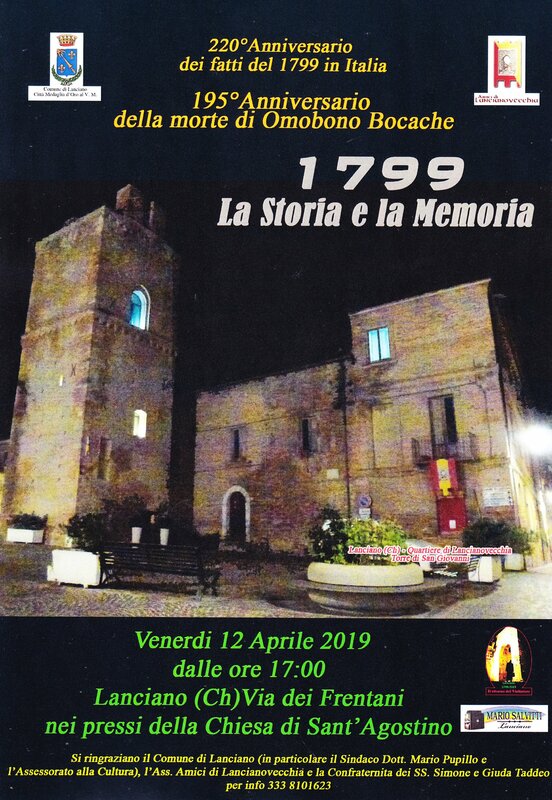 Because of information it is assumed that this association Fontevecchia, promoted an initiative in memory of the dramatic events of 1799, the SV please take part in this important event in Lanciano, which also provides awards forFriday, 12 April 2019 from 17. The ceremony will be sponsored by the City of Lancaster and the Association of historical "Lancianovecchia Friends". 220 ANNIVERSARY CELEBRATIONS ORGANIZING COMMITTEE OF FACTS 1799.